A FREE preview of my non-fiction zoo passages! Do you have a zoo unit? 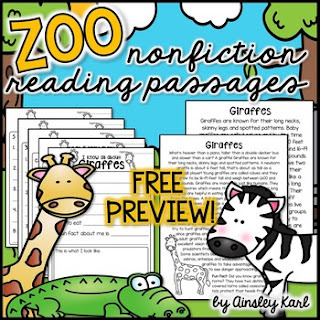 Add these non-fiction passages to your day for a fun and engaging activity! Use these for close reads, examining tough vocabulary and reading multiple times as you fill in the provided graphic organizers. Please download the preview for a 1 complete set free . This will help you to gauge if these will work with your students. Student reading levels can vary significantly. We’ve all had those groups who come in much higher or lower than you’d expected. *The preview cover is in black and white due to the limits TPT places on preview file sizes! Follow me by clicking the ★ above to receive updates on my newest freebies and products!